Team Stars & Stripes scored 56 unanswered points against the American Football Academy (AFA) at the Shanghai Lixin University of Commerce Stadium to win the Global Ambassadors Bowl China. The game between the select squad of student-athletes drawn from multiple schools and states across America and their Chinese hosts highlighted a nine-day visit to China. 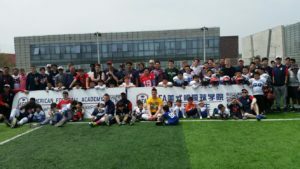 The visiting players and coaches held a youth clinic before the game, which was played to a crowd of about 800 spectators on a warm and sunny Saturday afternoon in Shanghai. 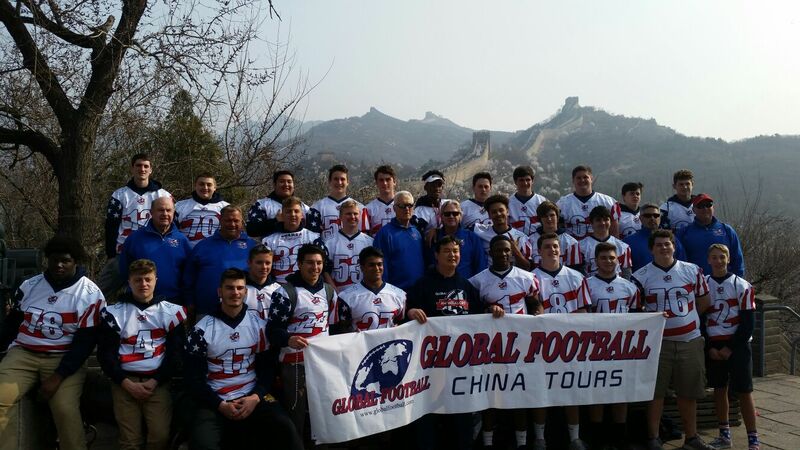 The annual Global Ambassadors Bowl provides the opportunity of a lifetime for deserving student-athletes to travel internationally, while playing the sport of American football and representing their school, state, nation and themselves. The squad of high school senior standouts is selected as much for a player’s conduct off the field as for his performances on the gridiron and is known as Team Stars & Stripes. Evan Pearlman (Milken School, CA) returned an interception for a touchdown to open the scoring then quarterback Jaden Casey (El Camino HS, CA) hooked up with Tyrell Morford (Lincoln HS, WA) for a 47-yard scoring reception and added a two-point pass to Brandin Porter (Lincoln HS, WA) for a 14-0 lead. The Americans led 20-0 at the end of the first quarter after a seven-yard Divine Buckrham (Kriski Prep, PA) run. Casey lined up under center to connect with Buckrham with a 56-yard scoring pass and then found Dan McGarry (Villa Angela St Joseph, OH) for the two-point conversion. Kyle Goldman (Milken School, CA) scored from six yards out and Buckrham added two points on the ground, before the Casey to Buckrham tandem, this time over 44 yards, brought up a 42-0 halftime score. Kevin Daniel (Episcopal Academy, PA) found the end zone for an eight-yard score for the only points of the third quarter and two fourth quarter touchdowns rounded off the scoring. Daniel scored six more on the ground from 18 yards away and Perlman rushed for a touchdown. China became the 28th country to welcome Global Football travelers when hosting the ninth Global Ambassadors Bowl between April 1 and 9. Team Stars & Stripes experienced spectacular cultural sites including the Great Wall, the Forbidden City, Tiananmen Square, the Beijing Olympics Complex, and a Shanghai River tour. Coaching with Adamson on the staff were longtime Penn Charter (PA) coach Bill Gallagher, Jerry Ralph (El Camino High School, CA) and John Storey (Villa-Angela St Joseph, OH). 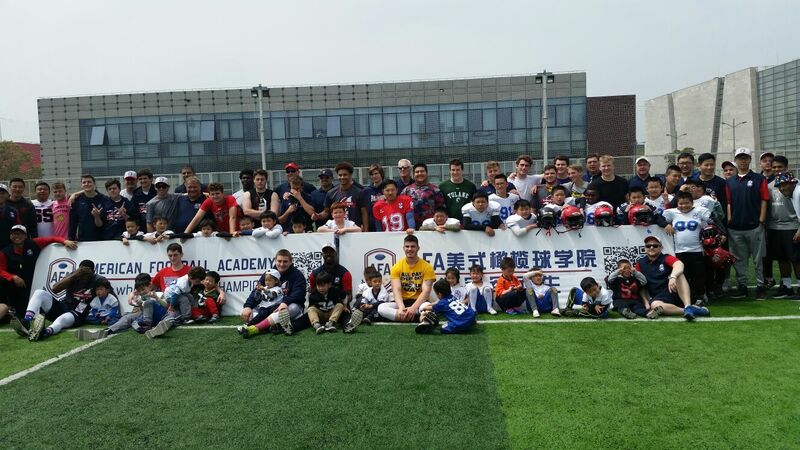 The Chinese American Football Academy team coaching staff included McLaurin, as well as former AFLC Titans Head Coach Kevin Coleman, former Ohio State cornerback Dionte Allen, former U.S. H.S. Defensive Line Coach Eric Minor, and local coaches from the Shanghai area. The Global Ambassadors Bowl traces its origins back to Japan in 2008 and has taken high-school aged travelers and mentoring coaches to Europe and Asia to expand their appreciation of the world, make new friends and play football. The series has graced Japan (2008 and 2009), France & Belgium (2010), Germany (2011), Italy (2012, 2013 and 2015), Spain (2014) and Czech Republic & Germany (2016), with Team Stars & Stripes boasting an 8-2 overall record.